What Does The Future Treatment of Asthma Look Like? Asthma is characterized by bronchial hyper-reactivity to certain physical or chemical irritants leading to release of inflammatory cells in the airways, causing wheezing, coughing, shortness of breath, and chest tightness. Asthma is a chronic medical condition that has been increasing worldwide and is a major cause of disability, sick days in school and workplace, increased health-care expenses, and an important cause of preventable death in children and adults. Asthma is characterized by bronchial hyper-reactivity to certain physical or chemical irritants leading to release of inflammatory cells in the airways, causing wheezing, coughing, shortness of breath, and chest tightness. The word Asthma is derived from the ancient Greek word aazein, which means panting or exhaling with open mouth. Asthma has different clinical types such as allergic asthma, exercise induced asthma, cough only (cough variant) asthma, eosinophilic asthma, nocturnal or night-time asthma, and steroid dependent asthma. Asthma is highly common in children and adults with allergies and those with a family history of allergies. The usual asthma triggers are air pollution, outdoor allergens such as grass, trees, pollen, and indoor allergens such as cats, dogs, and dust mites. There is also a link between asthma in children due to the mother smoking during pregnancy and exposure of babies to a smoking environment. Asthma affects roughly 25.7 million people in the USA, including 7 million children under age 18. Asthma affects more than 300 million people worldwide. About 10 to 15% of these will have risk for severe asthma where common asthma drugs may not work. Asthma has been steadily increasing in the USA from 3.1% in 1980 to 5.5% in 1996 and 7.3% in 2001 to 8.4% in 2010. That translates to roughly 1 in 12 people having Asthma in 2010 in the USA. Asthma is on the rise globally as well. Asthma is usually diagnosed with CXR and a breathing test called a Pulmonary Function testing. This breathing test is characterized by bronchial hyper-responsiveness or improved airflow after albuterol inhalation. This test can be normal as well in controlled asthmatic people, and hence, a normal test does not rule out Asthma. Sometimes when the diagnosis of asthma is in doubt, a bronchial provocation test called methacholine challenge test can be ordered at the advice of a pulmonologist. In people with poorly controlled asthma, skin or blood allergy testing and a blood test for serum IgE may be needed to diagnose allergic asthma. Similarly, sputum eosinophils may be needed to diagnose eosinophilic asthma. The treatment for asthma is usually divided into 2 classes: short term bronchodilators for quick relief of asthma symptoms and long term bronchodilators for overall asthma control. The most common short term inhaler is albuterol. The long term controller inhalers are usually a combination of inhaled corticosteroids and inhaled long acting beta-agonists. 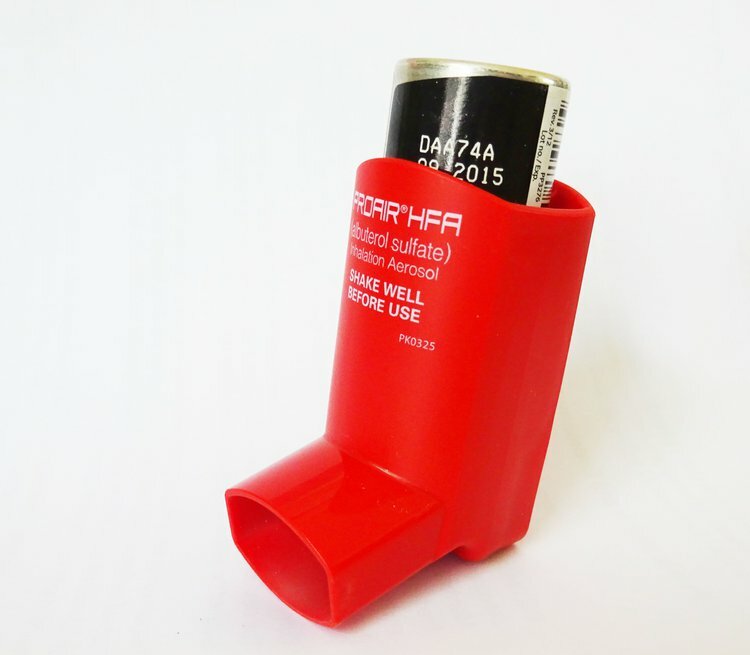 There are several of these inhalers which are available as single or combination agents. It is common to start the treatment with just an inhaled steroid and escalate therapy based on poor control of the asthma. Also, it is common to de-escalate therapy once good control has been achieved. A common oral medication known as leukotriene blockers (monteleukast, zafirleukast) is also used for asthma control. Finally, for people with poorly controlled allergic asthma (having elevated IgE levels) with frequent exacerbations or needing oral corticosteroids, there might be a role for subcutaneous injection therapy with a monoclonal antibody to IgE called omalizumab (commonly called Xolair). Asthma death is preventable; still there are about 3600 deaths each year in the USA. Hence, Asthma patients should take their medications regularly and follow up with their primary care physician, allergist, or pulmonologist. They should regularly monitor their peak flows and use an Asthma Action Plan to help control their asthma and call their doctor for advice. They should also avoid their known triggers such as avoiding outdoors during peak pollen days and avoiding indoor and outdoor allergens that worsen their asthma control. Smoking is not a good habit for a person with Asthma since it can precipitate asthma attacks. Additional medical problems such as acid reflux from the stomach (Gastro-esophageal reflux disease) and allergic rhinitis would need treatment with acid suppressing medications and nasal steroids respectively for better control of the asthma. There are research projects currently underway to look at other classes of medications to improve asthma. These include medication which can specifically target inflammatory cells such as neutrophils causing airway inflammation and medications which can block specific receptors such as eosinophils causing airway eosinophilia and asthma. Bronchial thermoplasty is already being used to help a subset of people with poorly controlled asthma. The procedure is FDA approved and done by bronchoscopy and delivering controlled thermal (heat) energy to the airway walls, which helps reduce the airway muscle thickness. J Asthma 1982;19(4):263-9. Bronchial asthma in the medical literature of Greek antiquity. Clin Exp Allergy 2012 May;42(5):706-11. Severe asthma: future treatments. O'Byrne PM, Naji N, Gauvreau GM.